A probable distant relative contacted me recently, saying that she had come across the will of our common ancestor Alexander Tocher (1754-1844) on the Scotland’s People website. She found it too difficult to transcribe, so I cheerfully offered to try. Little did I know what would be involved! The handwriting is quite clear since the document was written by a court clerk, nevertheless, numerous words were hard to decipher. The unfamiliar terminology related to Scottish inheritance laws and land ownership proved the biggest challenge, and some complex sentences seemed to go on forever. Still, I hoped this document would reveal more details about Alexander and his family. I already knew something about the Tochers, based on an outline of the family’s history compiled by an unidentified family member many years ago and verified by my own research, including a visit to the Tocher grave in Scotland. Alexander married Elizabeth Stephen in 17984 and they had three daughters, Margaret, Elizabeth and Jane. After his wife died in 1805, he married Ann Haslopp. He died on February 10, 1844, age 89.5 By that time, Jane (1803-1838, my great-great-grandmother), had died6 and his son-in-law was probably considering moving the family to Canada. What Was in Alexander’s Will? Some of my ancestors left quite personal wills, affirming their faith in God or expressing regrets for things they had done in life. Not so Alexander. This document is an inventory of his moveable property and a Disposition and Deed of Settlement from the Banff Sheriff’s Court. The inventory of Alexander’s moveable property indicated that he probably lived quite comfortably. Among his possessions were a portable writing desk, a dozen silver spoons, an eight-day clock, two feather beds, and two tea kettles, four pots and an oven. His most valuable possession was a branded cow with no horns. The total value of the inventory was 33 pounds, 12 shillings and eight pence. Alexander mentioned his two sons-in-law in his will. He noted that he had loaned 200 pounds at four percent interest to Margaret’s husband, merchant Alexander Carny. It had not yet been repaid, and he directed his executor to forgive 180 pounds. Similarly, he had loaned 170 pounds to Jane’s husband, teacher James Smith, and he directed that debt be discharged. Other than this, Alexander’s will did not mention family members, probably because Scotland had clear rules about who was to inherit. Heritable property (land and buildings) was to go the eldest son, while wives and all children had equal rights to moveable property. The most extensive part of the will concerned his real estate: four tiny pieces of land in the town of Macduff. He had acquired them at different times, perhaps with the intention of consolidating them and building a house. He left these lots in Elizabeth’s hands. The fact that he had any land was a surprise. The vast majority of Scots were tenants. According to the Statistical Accounts of Scotland, 1834-1845, the Earl of Fife held almost half the land in Gamrie, the parish in which Macduff was located. In fact, the system of land ownership in Scotland was still a feudal one. Technically, Alexander was not a landowner, but a feuar: a vassal who paid annual dues for the right to use the land. After transcribing five of the will’s six pages – including lots of question marks and blank spaces -- I gave up, but by then I had learned a lot about my ancestors’ lives in 19th century Scotland. 2. Peter John Anderson, Officers and Graduates of University and King’s College Aberdeen, 1495-1855; Aberdeen: Printed for New Spalding Club, 1893; https://archive.org/stream/officersgraduate00univuoft#page/254/mode/2up, accessed Nov. 19, 2017. 3. Monument Inscription, Doune Kirkyard, Macduff. Viewed personally, 1 June, 2012. 5. Scotland, “Search Wills and Testments, 1513-1925,” database, ScotlandsPeople (www.scotlandspeople.gov.uk : accessed Nov. 19, 2017, entry for Alexander Tocher, 8 January, 1845. 6. Monument Inscription, Doune Kirkyard. Chris Paton, Discover Scottish Land Records, Unlock the Past; Milton, Ontario: Global Genealogy, 2014. The nine authors of Beads in a Necklace: Family Stories from Genealogy Ensemble are, left to right, Mary Sutherland, Janice Hamilton, Barb Angus, Tracey Arial, Lucy Anglin, Marian Bulford, Claire Lindell, Sandra McHugh, Dorothy Nixon. The book is now available on Kindle as well as in paperback. Here is a panoramic photo of the launch last night of this collection of short stories about our ancestors. The nine authors (center) were present, along with invited family members and friends. 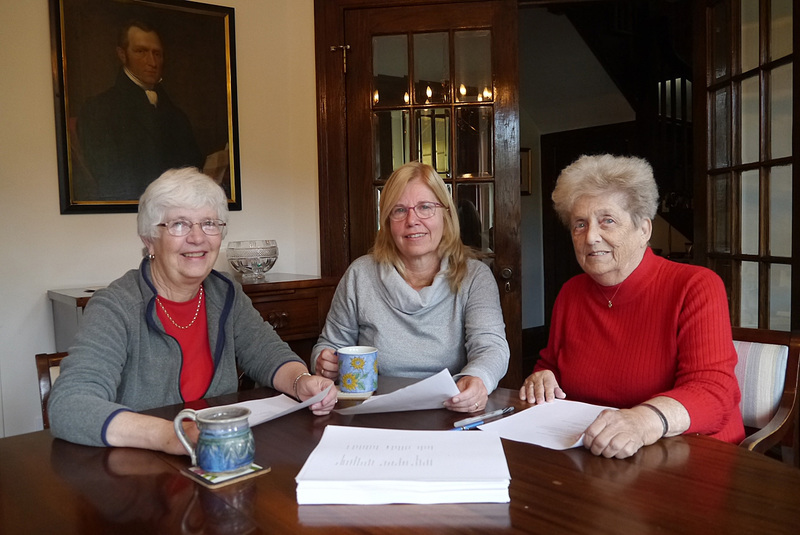 Gail Dever, rear left, an original member of our writing group and now celebrated writer of the blog www.genealogyalacarte.ca, acted as emcee. The authors all brought some of the family heirlooms that inspired their stories. Barb Angus (shown) and Marian Bulford each read one of their stories from the book. Justin Bur (lead author of the recently published Dictionnaire Historique du Plateau Mont-Royal, ecosociete) David Rosenberg, Janice Hamilton. Tonight is the night Beads in a Necklace: Family Stories from Genealogy Ensemble will be launched. I just came back from doing an interview on CBC radio about the book, and tonight all nine authors get together to see it and feel it in our hands for the first time. We have invited family members and friends to join us for this celebration, so tomorrow we'll post pictures. Meanwhile, here is an look at the cover, and a copy of the media release we prepared. If you are a genealogist, a creative writer, or are the kind of person who loves reading about the lives of ordinary people whose real-life actions and relationships were discovered within piles of papers, historical photos and old newspaper clippings, Beads in a Necklace is for you. A self-published paperback is on sale for $20 in Montreal at Livres Presque 9/Nearly New Books, 5885 Sherbrooke O; Montreal, Quebec H4A 1X6, 514 482-7323. Earlier this week, I got together with fellow authors Sandra McHugh and Claire Lindell to go over the (almost) final draft of Beads in a Necklace: Family Stories from Genealogy Ensemble. This collection of 49 short stories, written by myself and eight other family historians, will soon be a beautiful, 250-page hold-in-your-hands paperback book. Some of these stories were first published on Writing Up the Ancestors and/or our collaborative blog www.genealogyensemble.com. Genealogy Ensemble – recently named by Feedspot.com as one of the 100 top genealogy blogs – has been online since 2014. Things were going so well with it that we decided to choose some of our favourite stories and put them together for posterity. 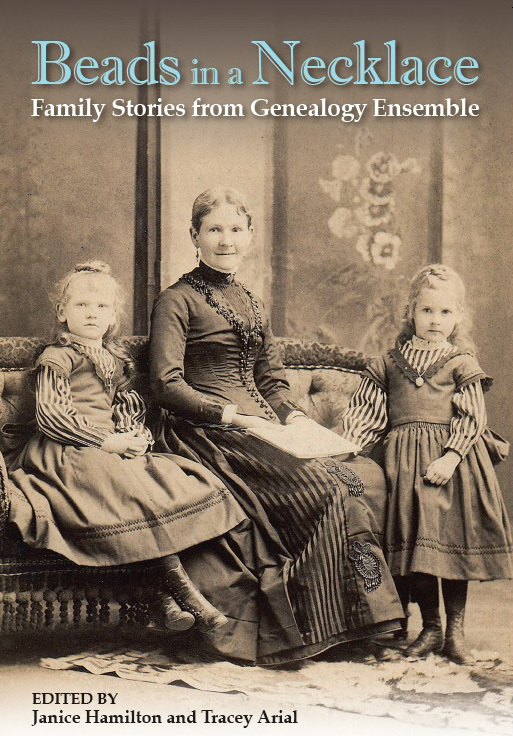 For the book, I chose Montreal-based stories, including two about merchant, tavern-keeper and canal-builder Stanley Bagg (1788-1853), one about Irish-born hardware merchant Henry Mulholland (1809-1887) and one about his daughter Jane (1847-1938), my great-grandmother who lived in her own world in a big house on the slope of Mount Royal. I also included two new stories. One explained why my family remained in Montreal throughout the difficult years of the referendums on Quebec sovereignty, and the other described how I grew up surrounded by the portraits of my ancestors. I knew very little about them, but eventually they inspired me to start researching my family’s history. The launch of the limited edition print copy of Beads in a Necklace is scheduled for Nov. 15. We’re all super excited about sharing this achievement with friends and family members. I’ll let you know soon how to obtain a digital or print copy of the book, so check out this blog, or Genealogy Ensemble, for further details.